With the rise of Oculus Rift, Sony PSVR, HTC Vive, and the One Plus Cardboard, virtual reality has already captured a huge market. Technology enthusiasts are already realizing the potential of virtual reality, which is here to stay and already affecting the gaming market. In fact, it is estimated that the virtual Reality Market will be worth 33.90 Billion USD by 2022. Such massive industry potential is likely the driving force behind a lot of the major companies now jumping into the VR scene. Everyone from Sony to HTC current developing or have released such a range of products with heavy gaming scope in virtual reality. Constant upgrades in technology, such as 3D effects, motion tracking, and 3D 7.1 Dolby surround sound are pushing the rise of immersive virtual reality. Using a standalone headset requires a powerful PC or laptop as well, however buying PSVR will make things easier and cheaper if you already have a console. No matter what the virtual reality (VR) headset you are using, combining it with the best PSVR (PlayStation Virtual Reality) headphones gives you that ultimate immersion experience. During Playstation gameplay, when your real world is replaced by virtual surroundings, you will have a lot to hear from all around you. But, if you hear the real world too with your VR headphone on, then it certainly takes you away from that experience. The best quality PSVR headphones will let you see something coming from the direction you just heard, each time. Surrounded by sound, the 3D audio of PSVR systems hacks your brain. Today, binaural audio is more authentic to our ears than the stereo. The audio system design replicates the way we hear in a spatial environment. By inserting the new 3D audio, the spatial information introduces a virtual experience. This allows audiences to get a sense of what is happening behind them or even elsewhere in their virtual space. The carefully crafted 3D audio wraps itself around you, so you feel the immerse more into the pull and look deeper. 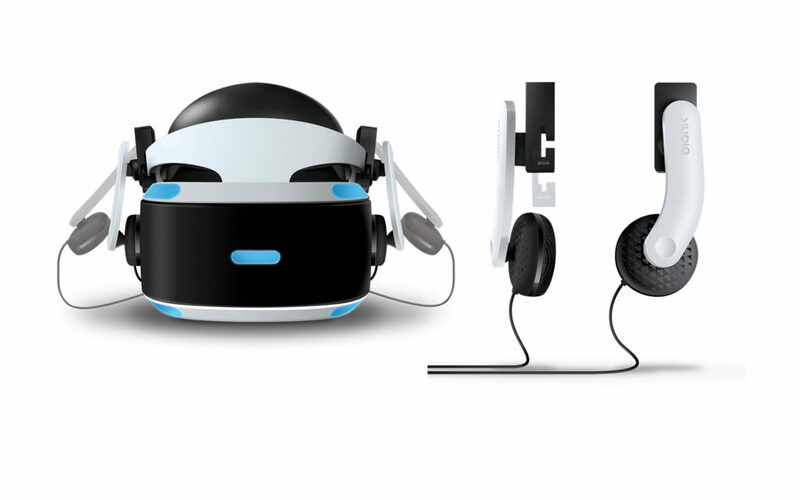 Here’s a look at the top PSVR headphones. Killer headphones are the big upgrade to your PSVR experience. The good news is that you have a lot of options to choose from, which compliments your PSVR. If you are not sure of which wired headphone should you go with, here are the two big features that you should watch out for: outstanding audio quality, and comfortable over-the-ear coverage. When playing VR games for an extended period of time, you would want to mute the world around you along with comfort, which is a big deal. Without wearing proper VR on-ear headphones set during longer gaming sessions can provide a lot of room for discomfort. Choose on-ear whenever you can for VR! Wired headphones also mean that there would be another cable dangling body while playing in VR. This could be problematic for VR gaming sessions with PS controllers. So, if you’re thinking about going wireless, pick up Sony’s Playstation Gold Wireless designed specifically for the Playstation 4. It delivers excellent depth and audio clarity that takes your gaming experience with custom audio modes to the next level. An exclusive Playstation 4 limited edition bundle, the stereo headphone is designed for you to experience everything from huge explosive booms in alien worlds to even the soft rustling of the urban jungles in high fidelity 7.1 virtual surround sound. Also, the internal noise cancellation of the microphone makes connecting with friends and teammates easier. Take your sound with you with the included 3.5mm audio cable. The stylish comfort feature of Sony’s Playstation Gold Wireless lets you enjoy listening to audio for hours. With an unbeatable look already, you can further customize the headphone’s appearance by swapping the removable faceplates to fit your style with something else. 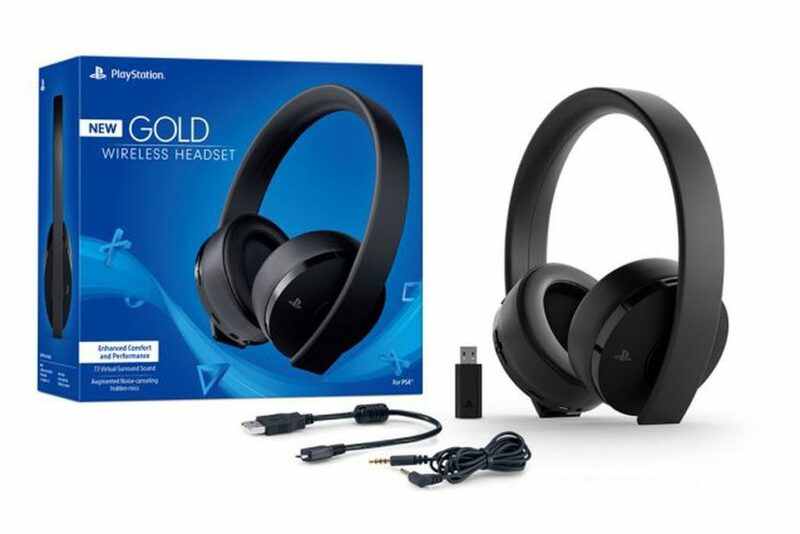 The sequel to the 2014 Playstation Gold Wireless is a notch higher with superior VR surround sound and cutting edge 3D audio that transports you into another world. Only few game developers are building the feature into their games at the moment, but in the upcoming year or the next we can witness the launch of such Playstation compatible gameplays. Setting up the wireless platinum Playstation is easy. If you appreciate integrating sound and music in VR, the best PSVR headphones like Sony’s Playstation Platinum Wireless is definitely worth the price. The top band consisting of two metal bars provides a lot of rigidity while firmly holding the headset in place. A rubber strap under the top band sits on your head comfortably. The headphones are lightweight and fold up neatly so you can carry it along with you. In fact, should you decide to go back to the stereo sound, all you need to do is flip on the right of the headphone over the earcup and you’ll go down a level. The best part of Sony’s Playstation Platinum Wireless is that you can use the headphone for more than just your Playstation. A 3.5mm jack equipped with the pair of headphones is compatible with your PC and other smaller devices. Also, the included wireless dongle into the PS4 can change the output from TV to headphones. Audio from games, music, movies, etc comes out crystal clear. Sony’s Playstation Platinum Wireless Headphones have exceptional audio performance and above average microphone sounds. The design of the headphone looks massive sitting on your head. Also, the headphone’s plastic areas feel fragile. Some users have reported that these PSVR headphones allow too much outer noise as padding isn’t tight against ears. However, at the higher price, platinum is surely a gamer’s best friend as it’s really hard to find a better value headphone that is so easy to use. 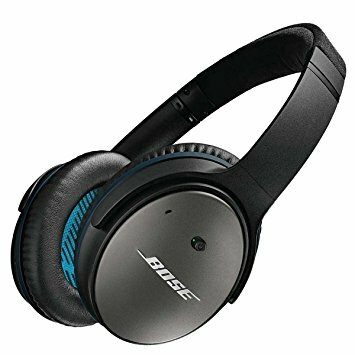 Having released some of the best quality headphones in the market, Bose’s products, although a little pricier gives you the ultimate VR audio experience. The Bose QuietComfort 25 cancels outside noise and lets you hear only the VR world. It’s not just about the sound only that gives the brand its iconic stature among audio products design companies. It scores higher in comfort, design and compatibility. The lightweight headphones fit comfortably around your ears. The detachable cables help you soak completely into the VR world when used with the Rift or the Vive. 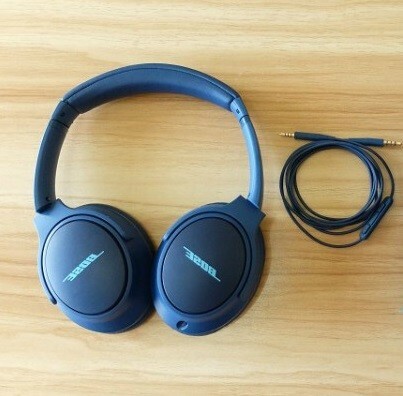 When it comes to outside noise cancellation, Bose QuietComfort 25 Noise cancelling headphones are a great buy! One stunning feature that sets Bose’s QuietComfort 25 apart is that it no longer needs power when the batteries run out, they can still suit the purpose but without noise cancelling capabilities. The spot-on, excellent headphones provide a more refined audio performance. With “Quiet” in the name, QuietComfort 25 actually drowns out all the noise around you. Don’t expect the top-notch noise cancellation of QC 25 to come that cheap. If not better, there are still other products in the line that are equally good sounding. 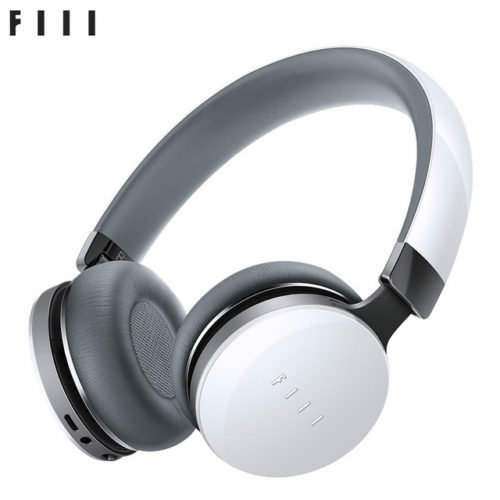 But, for you if noise cancellation is a must, especially if you are a frequent traveler and like to carry and listen to your audio on the move, then the investment is worthwhile. Also, its compatibility with top end VR headsets does make it the ultimate VR audio headphone at a price! Designed specifically for VR gaming, the lightweight product provides great comfort and style. The noise cancellation feature of GAME ONE keeps outside noise down. Small vents designed on the headphone surface keep your ears cool during hours of gameplay. A noise canceling microphone lets you talk to your friends and other team players. Again, if you don’t want to use the mic, use the mute button to put it off at your own convenience. Detachable cables help in comfortable movement during vigorous gaming sessions. Control volume by using the volume buttons built into the headphones. 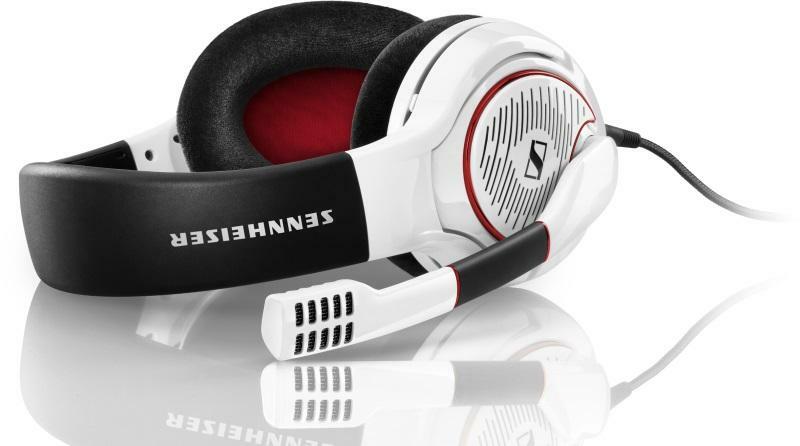 The Sennheiser GAME ONE is specifically built for gamers to enjoy the amazing comfort of use and great sound quality. The detachable cable allows easier game play using VR headsets. Finally, the ear pads contain air vents for easy passage of air so you can keep playing for hours without causing any discomfort to your ears. Not all headphones are designed for the VR experience. Bundle your VR headset with one of these quality headphones to experience the ultimate virtual world sounds. Become a part of the virtual world – live the sound with the best PSVR headphones! Bionik Mantis headphones for the PSVR just need to be clipped on the sides of the gaming headset. Plug them into the headphone jack near the volume slider and everything works seamlessly from here on. The headband sits on top of your head comfortably without pressing against your ears. The headphones clip onto the headset and blends in so easily that it doesn’t appear like a peripheral at all! The audio quality is at par with the Rift’s incredible 3D stereo sound. The material is quite different and not as soft as a majority of the high-end designs. 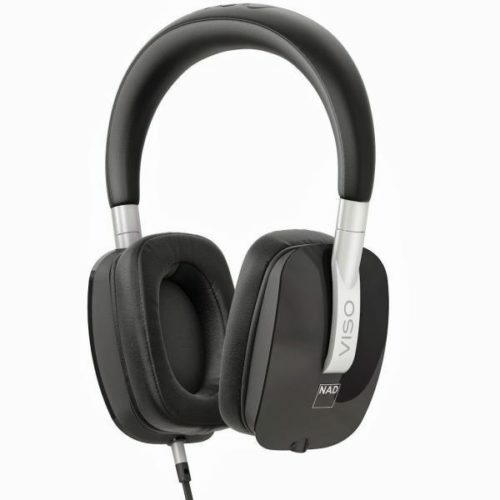 It has more of a glossy finish with incredible noise-cancellation feature. In fact, when compared to the pricier lot it is much more soundproof and does not let movements from outside cause audio hindrances. The headphone supports 360-degree audio to deliver unbelievable surround sound all around you. An interesting aspect of the Mantis Headphones is that they match the PSVR headset perfectly with the stylish white and black color supporting Bionik’s concept to look as close to the official. The retail price of the Mantis is $49.99 approximately. For those looking for premium audio and great value without the high price, the NAD HP50 is another recommendation for your PlayStation. Their lightweight design and overall flexibility isn’t available at the cheapest of price, but the incredible value it adds to your gameplay exceeds most of the entries to this list. These headphones are among the best for virtual reality. One of the headset’s unique features is its variable audio output. A 3.5mm detachable audio cable is plugged into each ear, thus making the headphone more flexible. 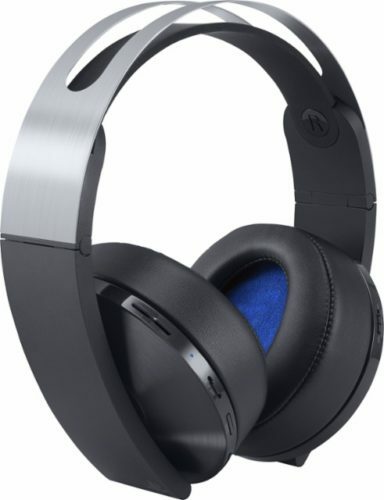 This goes along with the PSVR headsets and is a commendable inclusion to the top five PSVR headphones than most of the other expensive products out there. When it comes to audio quality, there are very few companies that can match up to the sound design that Bose audio equipment offers. Even in the virtual gaming scenario, Bose is definitely a top dog! The SoundTrue Around-Ear Headphones is yet another fantastic example of their commitment to quality. The incredible sound delivers tight bass and crisp treble notes along with the comfort of wearing them during long gameplay sessions. These do not chafe your ears during intense gaming as they sport a padded headband and ear cups made from memory foam. The audio cable is detachable, so if you want to replace the jack with a smaller cord you can easily do so. The compatibility of the device does not interfere with the smooth functioning of most PSVR headsets. However, if you want to integrate the headphone with your PC, VR gaming laptop or smartphone make sure you choose the best features for your device. 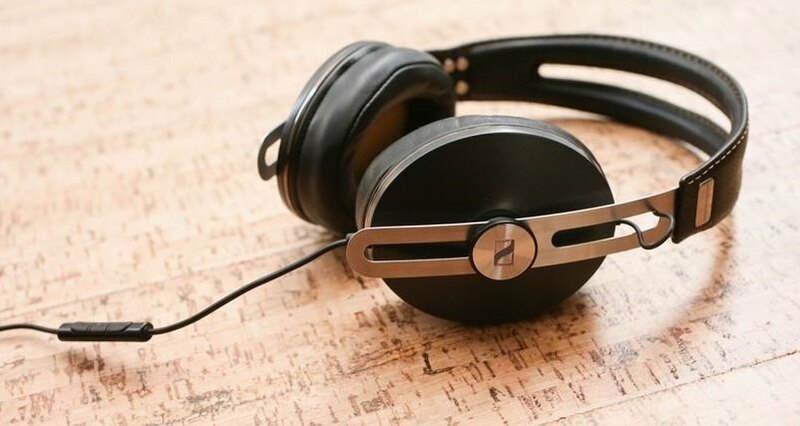 The Sennheiser Momentum 2.0 headphones are known for their superb sound quality. These deliver throbbing bass and clear high-frequency sounds that keeps you surrounded by the 3D audio during gameplay sessions. The unique feature of the product is that the headband is made of stainless steel. The over-the-head portion of the headphone is covered with leather such that you get all the comfort that you need, no matter whether it is for a shorter play or when wearing for an extended time. Another important feature of the headphone is its removable audio cable. Longer cables get in your way during the action. Shorter cables are best to enjoy an incredible no-clutter gaming experience. Although, the Diva Pro is an abstract choice for PSVR gamers, its design and full of incredible feature laden functioning make it a standalone product. The sharp, modern design and a plethora of high-end features offer a great range of traits from touch sensitive controls, on board storage and superior noise cancellation. The sleek, modern design compliments the features. Make sure you understand that your PC supports these headphones. Although, not officially available for purchase right now, the official website offers a lot of information and an insight of how you can obtain one of these products at a discounted price. The standard price is $300, which is a premium, but offers a promising option for VR users. Killer headphones complete your PSVR experience. This is also true for headsets combined with laptops- hearing sounds from your surroundings is a crucial part of VR gaming experience. When looking to upgrade your game play, these products are just the right investment that you should make. Knowing that something is coming from around your head or the sides is the true immersive technology. This can be achieved only with decent headphones, so you can hear only the virtual world and the real surroundings is kept distant!